The purpose of this Magnetic Safety Switch is to give an audio or visual warning that the telescopic mast, to which it is fitted, has not been fully retracted. 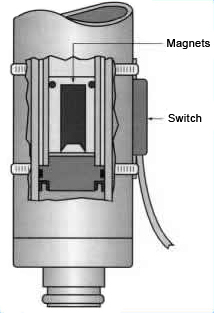 When fitted in a vehicle, the Magnetic Safety Switch can be used via a relay to interrupt the ignition circuit and prevent movement of the vehicle when the mast is not retracted. The Magnetic Safety Switch is fitted to the outer tube of the mast and is operated by a set of magnets placed at the bottom of the inner mast tube. The magnets are bonded into an aluminium housing and can be easily inserted into the top section of the mast without any dismantling. The plastic end-cap of the top section is removed and the magnet housing is inserted into the section. It is automatically retained in position by a neoprene ‘O’ ring. The Magnetic Safety Switch can be fitted onto any of our mast range in any application.